For the 1915 novel, see Robert Grant (novelist). For the album by Lido Pimienta, see La Papessa (album). The High Priestess (II) is the second trump or Major Arcana card in most traditional Tarot decks. This card is used in game playing as well as in divination. In the first Tarot pack with inscriptions, the 18th-century woodcut Marseilles Tarot, this figure is crowned with the Papal tiara and labelled La Papesse, the Popess, a possible reference to the legend of Pope Joan. This Tarot card was originally called La Papesse, or "The Popess". Some of the cards directly linked the woman on the cards to the papacy by showing the woman wearing a triregnum or Papal Tiara. There are also some modern versions of the Tarot of Marseilles which include the keys to the kingdom that are a traditional symbol of the papacy. 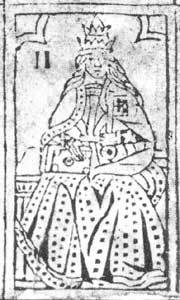 In Protestant post-reformation countries, Tarot cards in particular used images of the legendary Pope Joan, linking in to the mythology of how Joan, disguised as a man, was elected to the papacy and was only supposedly discovered to be a woman when she gave birth. However, Italian Catholics appear to only have seen the La Papesse as representing the Holy Mother Church in an allegorical form, with the Pope taking office becoming married to the Body of Christ, which Catholics refer to in the feminine gender. In the creation of the Rider-Waite tarot deck the La Papesse card, so confusing to non-Catholics, was changed into The High Priestess sitting between the pillars of Boaz and Jachin (which has a particular meaning to Freemasonry). Other variants that came after Rider-Waite are the Virgin Mary, Isis, the metaphorical Bride of Christ or Holy Mother Church. In Swiss Troccas decks, she is called Junon ("Juno"), the Roman Queen of the Gods. The "Flemish Deck" by Vandenborre (c. 1750-1760) refers to this card as Le Espagnol Capitano Eracasse ("The Spanish Captain Fracasse"), after a version of Il Capitano, a character from Commedia dell'Arte. Their leader, Guglielma of Bohemia, had died in Milan in 1281. The most enthusiastic of her followers believed that she was the incarnation of the Holy Spirit, sent to inaugurate the new age of the Spirit prophesied by Joachim of Flora. They believed that Guglielma would return to earth on the Feast of Pentecost in the year 1300, and that the male dominated Papacy would then pass away, yielding to a line of female Popes. In preparation for this event they elected Sister Manfreda the first of the Popesses, and several wealthy families of Lombardy provided at great cost the sacred vessels they expected her to use when she said Mass in Rome at the Church of Santa Maria Maggiore. Naturally, the Inquisition exterminated this new sect, and the "Popess" was burned at the stake in the autumn of 1300. Later the Inquisition proceeded against Matteo Visconti, the first Duke of Milan [sic], for his very slight connections with the sect. This identification has been supported by other Tarot historians, such as Michael Dummett in his book The Visconti-Sforza Tarot Cards. In the Rider-Waite tarot deck, upon which many modern decks are based, The High Priestess is identified with the Shekhinah, the female indwelling presence of the divine. She wears plain blue robes and sits with her hands in her lap. She has a lunar crescent at her feet, "a horned diadem on her head, with a globe in the middle place" similar to the crown of the ancient Egyptian goddess Hathor, but with the horns having a shape more like half-crescents, and a large cross on her breast. The scroll in her hands, partly covered by her mantle, bears the letters TORA (meaning "divine law"). She is seated between the white and black pillars—'J' and 'B' for Jachin and Boaz—of the mystic Temple of Solomon. The veil of the Temple is behind her: it is embroidered with palm leaves and pomegranates. The motif that hangs behind the High Priestess’s throne, veiling what ever mysteries she guards, is suggested in the pattern of The Empress’ gown. The two are sisters, one bringing life into the world, the other inviting the living to the esoteric mysteries. Further behind all of that is what seems to be a body of water, most probably the sea. The water flows through most of the cards of the Rider-Waite-Smith Tarot. 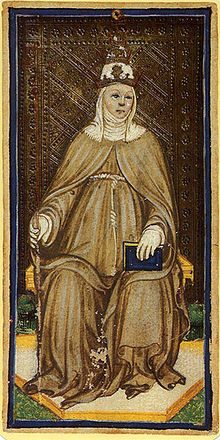 In the Tarot of Marseilles it is noticeable that she wears a blue cape and red robe, in contrast to The Pope, wearing a red cape and blue robe. In the Wildwood Tarot by Mark Ryan, this card is called "The Seer". In the Greenwood Tarot by Mark Ryan, this card is called "The Seer". In the New Orleans Voodoo Tarot by Louis Martinie, this card is called "Marie Laveau"
^ An Allegory of Blessings from the Church of Rome, Pre-Gebelin Tarot History. ^ The Pictorial Key to the Tarot, by A.E. Waite (1911). ^ Juliet Sharman Burke (1985). The Complete Book of Tarot. London: Pan Books Ltd. ISBN 0-330-28974-8. Waite, Arthur (1911). The Pictorial Key to the Tarot. London: W. Rider. This article incorporates text from the public domain 1910 book Pictorial Key to the Tarot by Arthur Edward Waite. Please feel free to update the text. This page was last edited on 29 January 2019, at 13:36 (UTC).